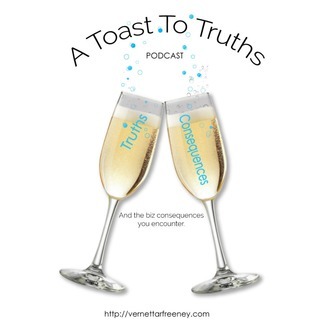 A Toast To Truths is my observation on hushed biz conversations that deserve a public dialogue. These “forbidden” truths often lead to mental, emotional and financial frustration because you don’t know who you can confide in to talk to about these issues. As your Truth Confidant, my special guest co-hosts and I are going to reveal the ugly truths and consequences of life as a real entrepreneur. Catch each episode of this unfiltered truthful podcast. Podcast Welcome: A Toast to Truths is where I share the mental, financial and emotional frustrations of being an entrepreneur. This is S8E6 “Launching a Startup After 50”. Charlette R Freeney is a veteran educator with over 30 years of teaching experience in both Christian and public schools. She has also had the experience of teaching in the United Arab Emirates as well as the United States. Charlette holds a Bachelor of Arts in Business Administration in Accounting and a Master's of Science in Education with an emphasis on Teaching English to Speakers of Other Languages (TESOL). Trained as a teacher through an alternative teaching program after a decade of US Government service, including the IRS, Charlette has always had a desire to see students achieve. But along the way, Charlette found more satisfaction and passion in helping coworkers achieve their highest potential. Having transitioned from government to teaching has positioned Charlette to see other perspectives of teaching that encouraged her to develop this opportunity to help students achieve by helping their teachers succeed. Pansy Walker is an educator with over 30 years in education. She began her teaching career working in the Head Start program in Brooklyn, New York. She has attended Teachers College (NY), Morris College (SC), City University of New York (NY), and Nova Southeastern University (FL). Ms. Walker has facilitated math instruction in NYC public Schools, Atlanta Public Schools and Clayton County Public Schools before she joined the educational reform in Abu Dhabi, UAE. In her role as a Math Academic Educational Adviser she coached and mentored teachers from Europe, Asia, Africa, Oceania, Canada and the United States. Once arriving in the United Arab Emirates Ms. Walker earned a Certificate in English Language Teaching to Adults from British Council. CELTA is a teaching English as a foreign language (TEFL) qualification that’s trusted by employers, language schools and governments around the world. Pansy is a certified John Maxwell Leadership Trainer, Coach and Speaker. In 2017 Pansy became a Managing Partner in Legacy Pro Mentoring, LLC where she continues supporting teachers. Pansy enjoys interacting with people who live to add value to people, and precious moments with family and friends. Q: Why do a second act in life? Who’s responsible for investing in you? Is Africa the land of opportunity? Where is legacy going next? Pansy- When you do something new, you can do it. Invest in yourself. Be confident. Your opportunities doesn’t have to be local. They can be global. Don’t be afraid to volunteer your services and meet needs. Charlette- What is it that you’re good at? Take an inventory of yourself and offer that. Then build from there. What you’re good at can be your cash cow. College isn’t for everybody. It’s hard to unlearn a bad habit. Vernetta- Don’t discount your previous career. Your skills, experience can benefit your business. Season- It’s okay to pivot. Sometimes, amazing things happen after a pivot. 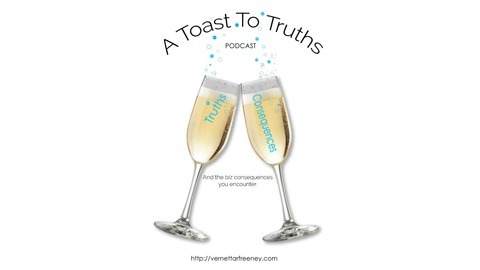 This has been ‘A Toast to Truths’ with me, Vernetta R. Freeney. This is season 8 episode 6 “Launching a Startup After 50” and the consequences we’ve encountered. S8E3 Where Are all the African American Marketers?